Turnout has the potential to be dismally low. May. 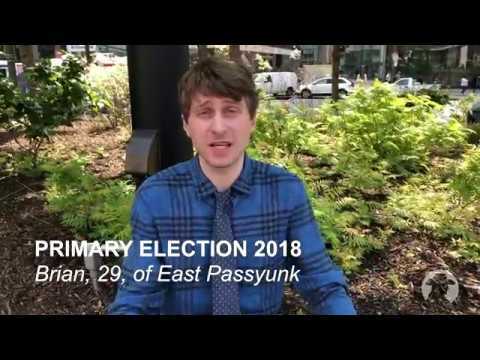 15, 2018, 6:45 a.m.
Of the 16 people Billy Penn surveyed about Tuesday’s election, only one named a candidate he was excited to support. Zaur, a 20-year-old from North Philly, was psyched about progressive state Rep. Chris Rabb, who is up for reelection. Two issues, though: Zaur doesn’t live in Rabb’s district (it’s the 200th, in Chestnut Hill) — and he won’t be going to the polls, anyway. While Zaur thirsts after the opportunity to have a say in government, many eligible voters will not take advantage of that right. Turnout for primaries in Philly is traditionally very low. Last year, around 18 percent of the electorate came out to the polls for the 2017 primary, and that was considered high for an odd-number year. The year prior, turnout was a whopping 39 percent — but that ballot included races for presidential candidates. Per numbers released by City Commissioner Al Schmidt, recent turnout in nonpresidential years hovers in the high teens or low 20s. This time around, there are no municipal races, and few intraparty battles that garnered wide attention. Still dressed in graduation regalia, Aimee, a resident of West Philly, said she wasn’t aware elections were being held on May 15. Her response was echoed by an overwhelming majority of the random selection of people who agreed to stop and chat while passing through Dilworth Park and Jefferson Station Monday afternoon. 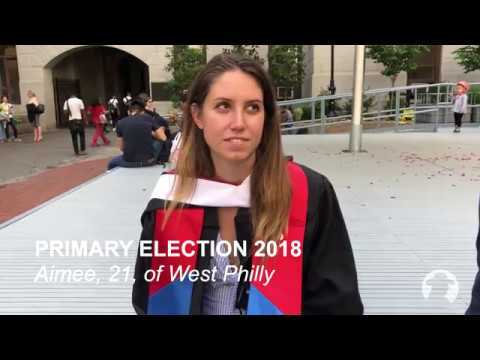 A woman also named Aimee, from West Philly, age 27, hadn’t been aware of the May 15 election before being interviewed, but said she would consider heading to the polls now that she knew about it. “No, no sabía que hay una elección,” answered Eduardo, 40, of South Philly. Didn’t know there was an election and not planning to vote, similarly answered Kyra, 21, of North Philly; Brittany, 20, of Mt. Airy; Janine, 42, of the Northeast; Jordan, 27, of State College; and Jill, 21, of West Philly. Caitlin, 28, a history teacher living in Logan Square, knew that there was an election because it affected her job: “I get tomorrow off.” Familiarizing herself with the candidates and races on the ballot was her Monday night “homework,” she said. One thing Caitlin could bone up on is her congressional district — confusion that played out across the board. None of the 16 people Billy Penn spoke with could correctly identify the United States congressional district where they live. A couple could name their U.S. representatives, and a few more gave a solid guess: they correctly named their City Council district or councilperson. In this case, there’s excuse for the confusion. This year’s primary election comes on the heels of the massive congressional redistricting of the entire state. The Pennsylvania Supreme Court ruled in January that Pa.’s congressional district map “clearly, plainly and palpably” violated the state’s constitution because it was too gerrymandered, and it ordered the legislature to submit a new map by Feb. 15 — just three months before the primary. Republican lawmakers proposed a map that Gov. Wolf swiftly vetoed, missing the court-mandated deadline and leaving it up to the state Supreme Court to create its own map. So this year, there’s a new map. And Republicans and Democrats alike agree that the new districts have probably thrown voters off. But pleading ignorance because of the map kerfluffle is only valid in the race for U.S. Congress. Not the whole ballot. “What’s the election?” asked 29-year-old Brian of East Passyunk, who seemed genuinely interested, just unaware. “I just didn’t really realize that was happening. Want some more? Explore other Election 2018 stories. Seems you’re the kind of person who really digs in. Want more? Sign up for our morning update, the quick, easy, free way to stay on top of Philly news. What is the current year? Billy Penn will land in your inbox every morning around 7:30 a.m.
You can add contact@billypenn.com to your contacts to stop overzealous spam filters from eating our messages. Thanks for reading Billy Penn! Like the story above, everything we publish is powered by our members. If you appreciate local news provide, join today. Does Billy Penn help you feel more connected to Philadelphia? Member donations are critical to our continued existence and growth — join us today! The story above was powered by reader support — thank you. Become a sustainer now with a monthly membership to help lock it in. Billy Penn members power our newsroom. Know someone who might want to support our work? Send them a link — they just might join the local journalism fight. The Head & the Hand Books will be a place to "look at works that aren’t glowing back at you." Watch a demo of the backpack leaf blowers that will scatter debris — so drivers don't have to move their cars. There's the semiquincentennial celebration — but also a sad, personal reason. The authority and the search engine giant are finally fully integrated. Philly has new partners in member-supported local journalism. ‘Councilmanic prerogative’ is a campaign issue. But WTF is it? A simple guide to City Council’s real estate power. Was Philly really in danger of getting hit by a tornado? It's happened before, and night strikes are even more dangerous. 25 great dishes to seek out and try. With no top-down message, the city's 66 political divisions can decide to back Jewell Williams despite harassment allegations — or not. There's been no lack of Philly drama since last year’s unwarranted arrests. Trauma surgeons have a sad name for these instances: "everyday mass shootings." The Office of Violence Prevention is giving out grants up to $20,000. Cleaning out your closet can benefit Philadelphians in need. The independent bookstore has been a West Philly mainstay for 57 years. A local art group used the mascot's likeness for its annual anti-catcalling campaign. Le Virtú's owner says Billy Ciancaglini's posts are inciting harassment. A year after ceasing public sales, the authority is preparing for a hard stop. There's plenty of underdogs who deserve local love. Go see it — for the Philadelphia cameos, sure, but also for the optimism. Weirdest thing you’ve bought while drunk shopping, Philadelphia? Apparently this is a $45 billion industry nationwide.